Last year marked the beginning of the centenary commemoration of WWI—the First World War, the Great War, the War to End all Wars. Those words give an idea of the cataclysm represented by the war, in which western civilization effectively destroyed itself. Centuries old empires disintegrated: that of the Austro-Hungarians, the Ottomans, the Czar, and of course the German Kaiser. The British Empire remained intact but its elite was decimated, while France won a Pyrrhic victory that shattered its national compass. America entered the fray towards the end (for President Wilson it was the War to Make the World Safe for Democracy) and emerged a world power, but the Versailles Treaty and Congress’s rejection of the League of Nations set the stage for the next war. 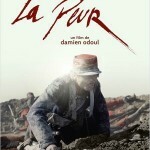 Damien Odoul’s La Peur (The Fear) is a frightening but brilliant film about how the war grievously damaged the soul of an entire generation. 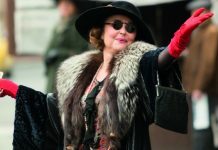 At the beginning of the film, the predominant emotion is not fear but exultant enthusiasm, with young men eager to enlist, urged on by their elders. One dissenter in a bar who stubbornly insists “I am a free man” is nearly beaten to death (calling to mind the assassination of anti-war socialist Jean Jaurès). 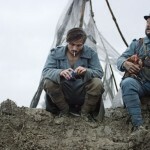 The film focuses on Gabriel, a young man out of Proust, though not quite so haut bourgeois. Before the war he had an idyllic life with a charming girlfriend, though he’d suffered the death of his mother. 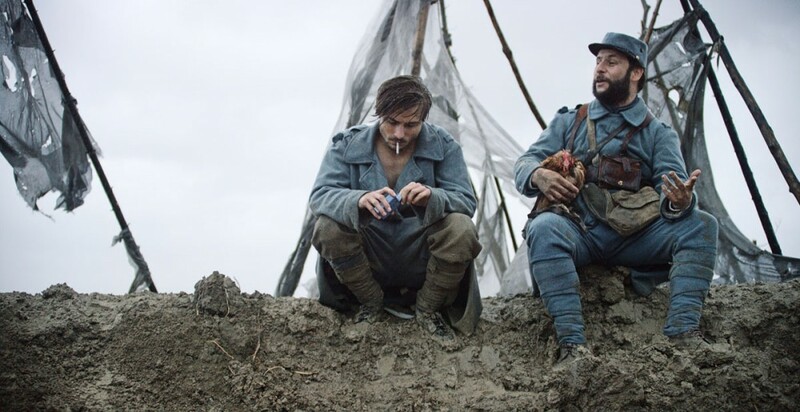 He tries to keep his integrity as he goes off to the front with his best friend Bertrand (Eliott Margueron) and a Rimbaud-type poet named Théophile (Théo Chazal). The film gives a compelling sense of the old nineteenth-century world suddenly dropped into the modern age at its most brutal. At the beginning the soldiers don’t even wear helmets, and there are more horses than motor vehicles on the road to the front. Odoul doesn’t show the airplanes, tanks and machine guns that first appeared in WWI, but we get a terrifying glimpse of a primitive flamethrower. Worst of all the diabolical machines is the powerful artillery, the “Big Bertha” whose shells obliterated the landscape. 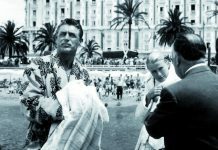 Nino Rocher gives a sensitive performance as Gabriel. His voice-over narration, expressing his indignation, serves as a counterpoint to the horrors we see. The problem is that it lacks the genuine depth and poetry of the voice-over in Terrence Malick’s WWII film, The Thin Red Line. The narration embodies little more than conventional humanism violated, and Gabriel’s character, while inspiring sympathy, remains opaque. If Gabriel would be perfectly at home in other WWI movies, such as All Quiet on the Western Front, Paths of Glory, and Johnny Got His Gun, the story and especially the description recall the war passages of Céline’s Journey to the End of the Night. Odoul creates set-pieces showing blasted terrain, labyrinths of trenches through which soldiers creep like rats, burnt-out buildings, and of course, lots of dead and dying and maimed. La Peur is not a movie for the faint of heart. Yet the director goes beyond realism, serving up details heightening the hallucinatory atmosphere. Gabriel also begins to have grotesque dreams and visions that blend into the nightmarish reality around him. This is all powerful stuff. What’s lacking is any objective macro sense of what’s happening in the war—whether we’re in the battle of the Somme, in the middle of an offensive or defensive action. We rarely see any officers, and everything seems utterly chaotic. La Peur’s perspective is the micro rat’s-eye-view of the ordinary foot soldier, so this seems plausible. Our confusion is uncomfortable but the feeling is authentic. 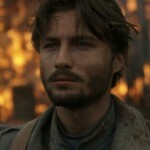 The film gets more lucid after Gabriel is wounded and spends time in a military hospital. The focus here turns to fellow patient Negre, a loud-mouthed rebel (brilliantly played by Pierre-Martial Gaillard) who spouts off against jingoistic clerics and authoritarian nurses. It’s reminiscent of MASH and Cuckoo’s Nest, but at least gives the film some heart and brain to go with all the spleen. Peace eventually comes, with the ringing of church bells, but it feels bittersweet to the men. Something has been lost deep inside them. Their crippled psyches will translate into a crippled society between the wars, and contribute to Le Debacle in the not-so-distant future. The film’s one grace note comes before the armistice, with the capture of two young German soldiers, little more than boys. 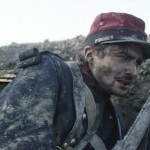 The Frenchmen treat the POW’s decently, but seem dumbfounded, as if thinking, This is what we were fighting? All of that for this? One hundred years later, bucolic areas in France contain numerous sites and memorials. Many young schoolchildren as well as tourists visit Verdun, in the Meuse department, site of a great battlefield and war cemetery. In the Somme, site of another great battle, are museums in the towns of Albert, Péronne, and Bray-sur-Somme. Near Paris, in Meaux, is a museum dedicated to the war. In Compiègne one can visit a replica of the railway car where the Armistice ending the war was signed. The original, of course, was carried off by Adolf Hitler.